Could you really land this bird on a beach? Just because we see it on celluloid doesn't mean it actually happened. Hollywood is famous for making the impossible possible. For creating reality within fantasy thanks to a playbox of CGI wizardry, cinematography cheats and smoke 'n' mirrors editing. We want to know the difference between the movie magic and the reality which is why – in our new regular series – we ask experts in their relevant fields to tell us what's a flight of fancy and what's down to earth of the crazy scenarios we see onscreen. 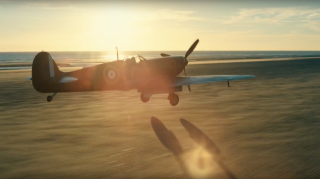 This time around we find the Spitfire ace who barrel-rolled and loop-the-looped through Christopher Nolan's Dunkirk to ask how much of what we saw was actually, practically possible. In Dunkirk RAF pilot Farrier glides his WW2 bird onto the titular beach. Possible or poppycock? "Spitfires did actually land on the beaches of Normandy during the war and I flew and landed the Spitfire you see in the movie on the closest beach to the village of Dunkirk. We had several practice approaches, but I only landed once. Once was enough! The primary consideration was tide because we needed it to be low enough to give me enough space to make the landing. Other big considerations were wind and wind direction. Wind effected the beach landing in 2 ways; 1, direction. Because obviously we needed something that was close to a headwind because the landing space wasn’t particularly long. 2, the speed of the wind. If it was very windy when the tide was going out, it created ridges in the sand that would make the landing more challenging. "It was pretty thrilling once I got it on the beach and made it to a stop"
At some point we just decided to go for it, there was no way to predict how it was going to go. I got an amazing amount of support and help from Emma [Thomas] and Chris [Nolan], who never made me feel any pressure to do anything that wasn’t safe. Tom Struthers and his ground crew gave me a lot of reassurance that every safety precaution was being taken and that made the whole experience a lot more enjoyable. There were no changes made to the plane – it was a stock Mk1 Spitfire configured just as it was during the war. It was pretty thrilling once I got it on the beach and made it to a stop. Prior to that it was a lot of focus and intensity. You are just in the moment and want to do it without embarrassing yourself too much!"